I’ve had some questions lately about some of the close quarters battle (CQB) techniques that I describe in my online novel, The Union Creek Journal. 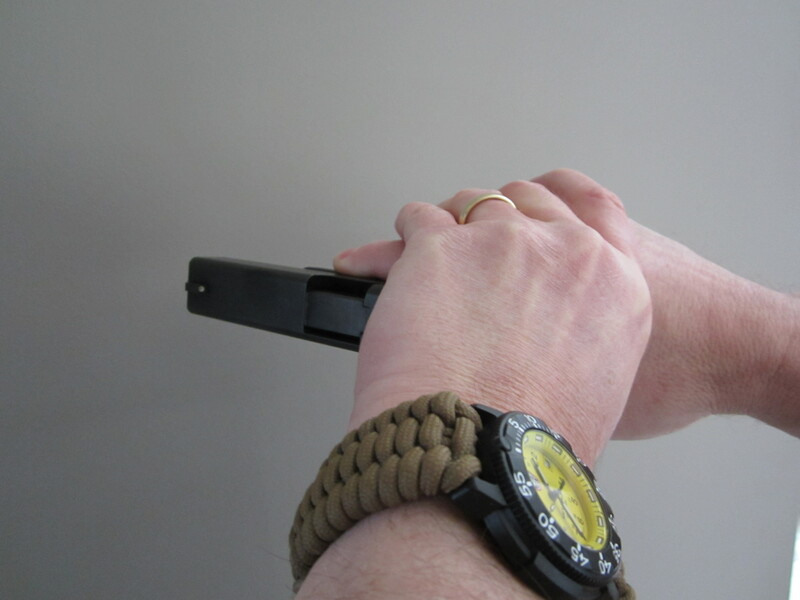 Specifically, one reader wanted to know about the technique that David utilized on Marta in Add These to the List when he encountered her in the abandoned farm house – a strike to the bridge of the nose with the trigger guard of his Glock 20. 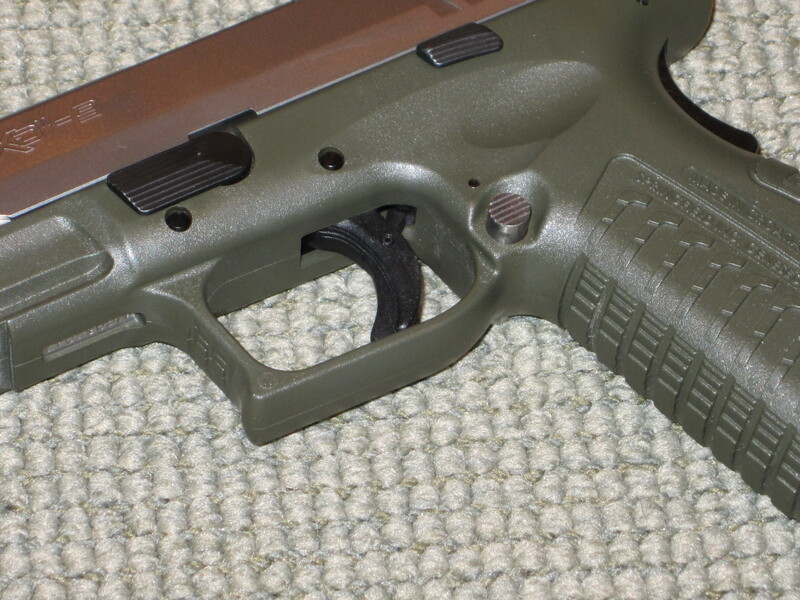 Glock pistols, as well as pistols made by several other manufacturers, have a small point on the forward section of the trigger guard. 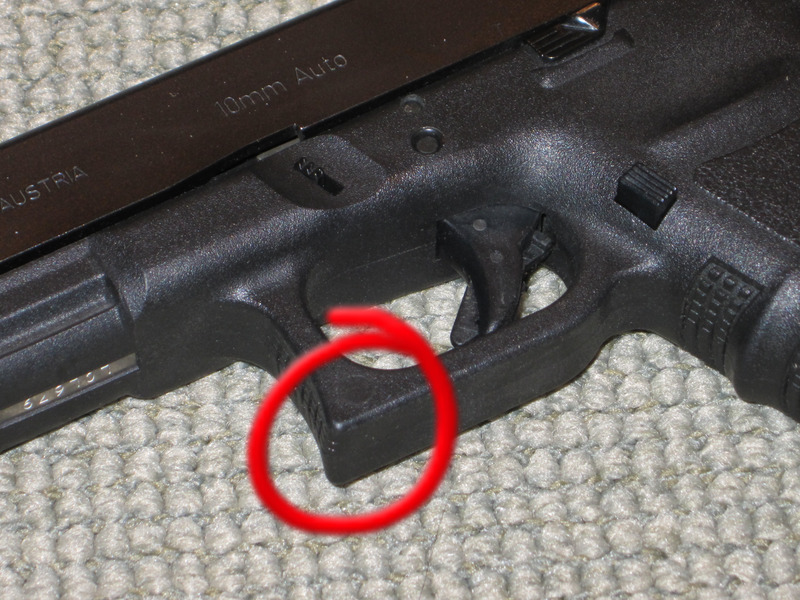 As I wrote in The Union Creek Journal, I’m not sure of the original intended purpose for this portion of the trigger guard but it is very effective when utilized on pressure points or other sensitive areas in CQB. In the photo below, I’ve circled the specific area to which I am referring. You’ll find similar points on most “battle” pistols – those designed to be utilized by military, para-military or law enforcement. 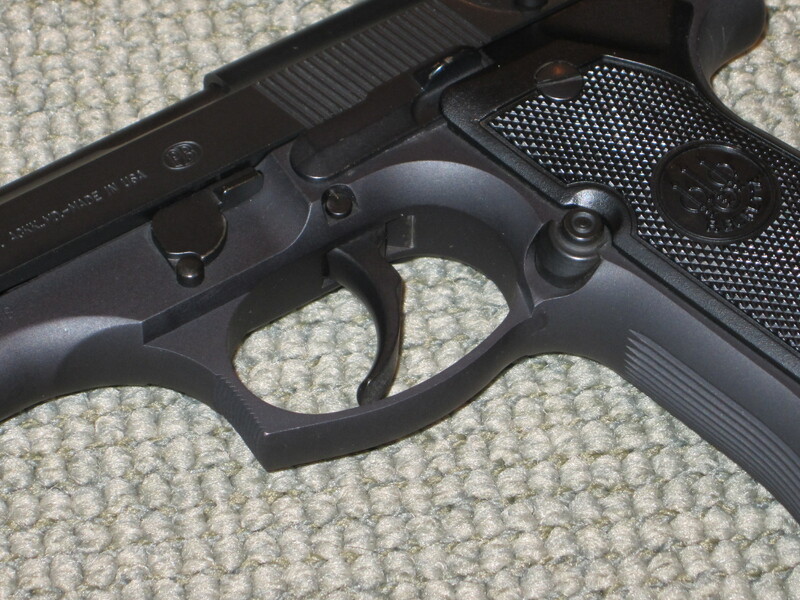 The photos below show a Beretta 92FS and a Springfield XDm. Both have a point similar to the Glock. Both can be utilized in a similar fashion. Let’s discuss why one might utilize these tactics before we get into the details of how one might utilize these techniques. CQB is an ugly thing. If you’re in a close-quarters fight, you’re probably fighting for your life. If you have a handgun, you have a better chance against an assailant who may have superior strength but that handgun is useless if it’s taken away from you. It’s of very little use if your assailant is close enough that they can push it aside or knock it from your hands. One of the primary purposes of a strike in CQB is to create distance. Generally, one’s ability to retain one’s handgun is directly related to one’s distance from one’s assailant. A strike to the bridge of the nose is highly likely to distract your assailant and allow you to back away. The space created when you back away from your assailant is precious distance that increases your chances of retaining your firearm. Retention of your firearm in a close-quarters fight, is the number one way to survive. In The Union Creek Journal, David utilizes the trigger guard of his Glock to smash Marta’s nose as she attacks him. The nose is certainly a prime target for such a tactic. With the exception of trained fighters, most people will reflexively “tear-up”, i.e. get tears in their eyes, when they are punched in the nose. Punch someone in the nose with the point of your pistol’s trigger guard and all but the toughest assailants will hesitate, if only for a moment. Some will end up completely debilitated. That hesitation gives you time to separate, create distance, retain your weapon and, perhaps, escape without having to shoot someone. Any day that you don’t have to shoot someone is a good day. If you are unable to escape, you have put yourself in a more advantageous position to protect yourself. Ultimately, only you can make the shoot/no-shoot decision. So, how is this tactic utilized? It has to be said … when practicing this tactic, as with any time you handle firearms, SAFETY FIRST! To deploy this tactic, you should start with a good, firm grip on your pistol. The web of your hand, between your thumb and forefinger, should be high up under the tail of your gun’s frame (see photos below). I prefer to index my trigger finger along the weapon’s slide when drilling this tactic to avoid an accidental discharge. 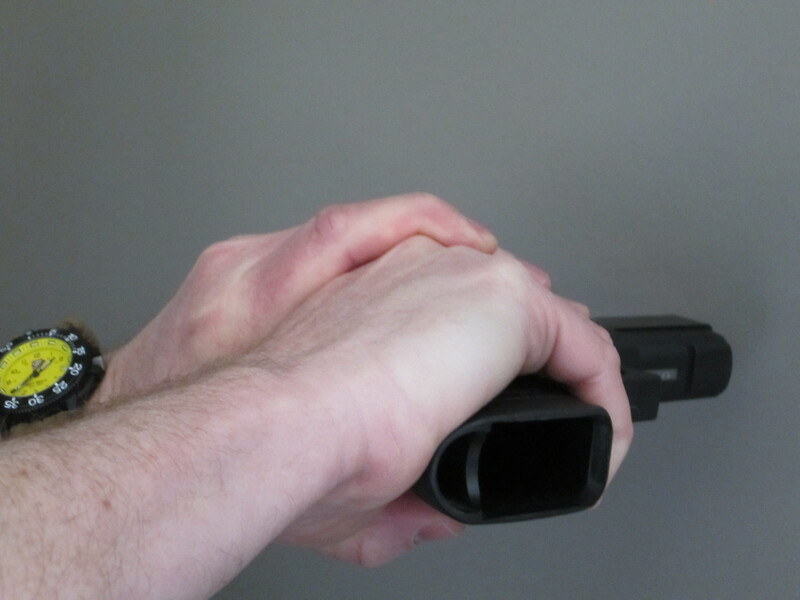 This technique is not limited to a strike to the nose nor is it limited to utilizing only the trigger guard of your weapon. Striking an assailant’s eye socket with the barrel of a pistol can also be effective. The larynx is another vulnerable area that can yield debilitating results when struck with any hard object. A note about pistol-whipping, as often seen in movies and on television. Pistol-whipping requires a wide swing which leaves you open to a counter attack. A savvy assailant will step inside of the wide swing, potentially rendering it ineffective and opening you up to greater danger. Keep your hands and arms up in front of you, protecting your vital areas as you strike. Strike quickly and return your hands and arms to a protective position immediately. As you become more comfortable with this technique, you may wish to integrate it into live fire exercises. Obviously, such exercises come with inherent risk. The practice is valuable. You must determine if its benefit outweighs the risk. If you are a novice shooter, I highly recommend that you seek out professional training and supervision before integrating techniques like the one described above into your live fire routines. You may also want to seek out specific training in close-quarters battle or hand-to-hand combat with firearms. Disclaimer: The preceding is neither legal advice nor advice to utilize these specific tactics in any given situation. Only you can decide when and how to defend yourself. Furthermore, you must accept responsibility for your safety and the safety of others should you choose to practice the tactics described above.